The pleasures of a cream tea are almost countless. This easy scone recipe only uses 3 ingredients, and it’s absolutely foolproof too. Enjoying a meal outside can be so satisfying! Surrounded by the smells, sights and sounds of a park or backyard, it becomes something more than a meal – an experience in and of itself, to be savoured and treasured. 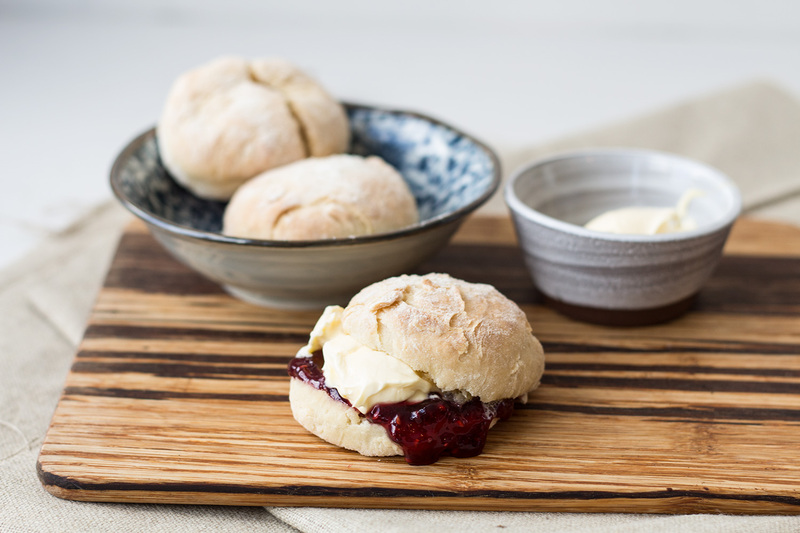 These next few weeks in Australia are the closest we Southern Hemisphere folk will get to the genteel warmth of an English summer, so it’s time to strike and enjoy that classic British staple, the Cream Tea. Scones, the cornerstone of the Cream tea, are what’s known as a ‘quick-bread’ – easy to make and best consumed on the day they are baked. This easy 3 ingredient scone recipe is so incredibly simple you’ll be able to whip up an impressive offering in about half an hour. I love bringing them out to guests hiding under and a tea towel, and then unveiling a steaming pile of them along with a fresh pot of tea. By combining flour with lemonade (to act as a leavener for rise, sweetness and a hint of citrus) and cream (for fat content and as a binding agent), you can whip these babies up in a flash, probably using ingredients you already have at home! In a large bowl, add flour and make a well in the centre of the flour with your hands. Add lemonade and cream and begin to bring together with a spoon. Well the mixture in better combined, you can use your hands to ensure all of the flour is brought into the wet dough mixture. Don’t worry if the dough is very sticky at this stage! 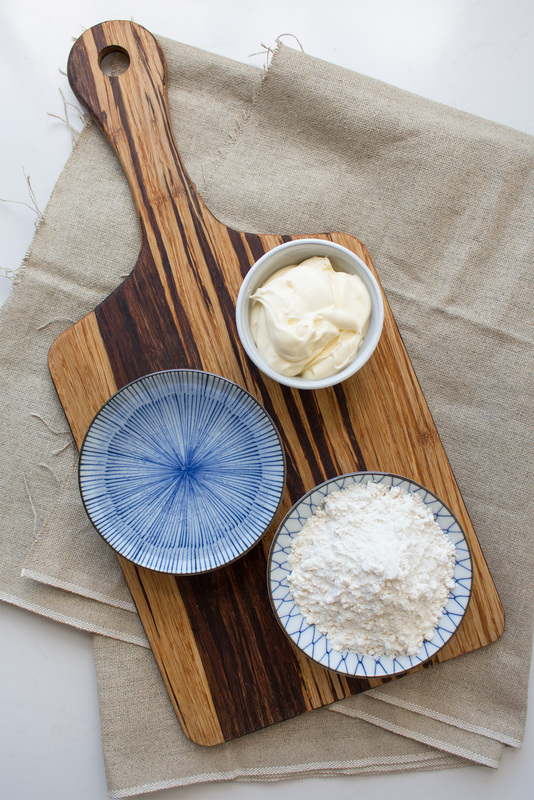 Turn out onto a well floured surface and knead the dough until it feels smooth and no longer stick to your fingers. Using your hands or a rolling pin if you prefer, roll out the dough so you have a thick ‘mat’, around 3-4cm thick. Using a ramekin or biscuit cutter around 7cm wide, cut out the rounds that will form your scones. Give them a little plump with your hands, dust lightly with sifted flour, and pop on a lined baking tray. Bake for 20 – 25 minutes or until the tops of the scones are burnished golden brown, and sound hollow when tapped on the bottom. Allow to cool slightly, then serve with freshly brewed tea, clotted cream and raspberry or strawberry jam (jam on first, please!). …And there you have it. Go forth and enjoy a fresh scone this weekend! Its cream on first sorry…unless you’re from Cornwall and then yes, you’d be forgiven for putting the jam on first. Anyone notice the Queen in ‘The Crown’ does cream on first in Season 2? The cream is the butter.